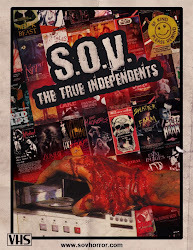 Coming soon to VHS and DVD from the fine folks at sovhorror.com is David R. William's lost S.O.V. masterpiece METAL NOIR. Shot in the late 80's, METAL NOIR tells the story of a young horror novelist Laurel, who recently moved into an old house with a strange past. Soon she is thrust into a world or pleasure and pain ruled by the maniacal Dark God. Thought lost for the last 30 years METAL NOIR was unearthed by sovhorror.com webmaster Tony Masiello when he discovered a VHS dub of the original edit. Unfortunately the master tapes for METAL NOIR were damaged in a flood so Masiello had to make a new cut of the movie using the VHS dub he had and the only other known surviving copy, an early workprint of the movie. Great care has been taken to re-create that original edit shot for shot, frame for frame to ensure the best viewing experience of Metal Noir possible. There is no official release date at the moment but stay tuned at www.sovhorror.com for more updates. 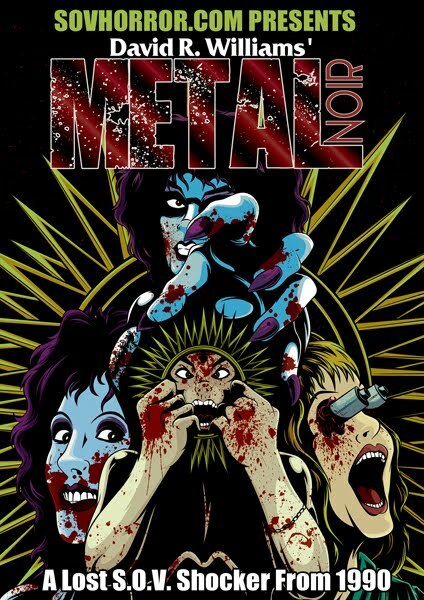 In the meantime enjoy this trailer for METAL NOIR, and keep an eye out for SOV alums Charles Pinion (Director TWISTED ISSUES, RED SPIRIT LAKE, WE AWAIT) and Hugh Gallagher (Director GORGASM, GOROTICA, GORE WHORE) in acting roles. All hail The Dark God!! !